After more than a century of being hunted to near-extinction, the iconic Indian rhinoceros is on the rebound. Officials from India's Assam region, home to more than three-fourths of the rhinos in existence, say that the species' numbers have spiked a remarkable 27 percent in less than a decade -- all thanks to the success of conservation measures put in place to save them. 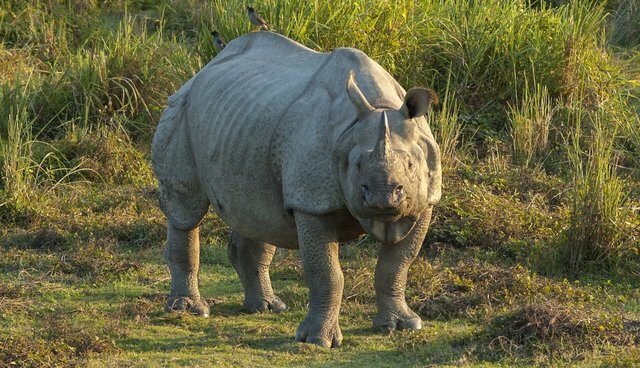 "We are taking various steps to protect rhinos with the help of wildlife experts and legal professionals," says Assam Environment and Forest Minister Rockybul Hussain. "As per the last rhino census, the population of the world famous animal has grown to 2,544 in entire Assam in 2013 from 2,006 in 2006." Kazirganga National park, now home to 2,329 Indian rhinos, has seen the greatest increase, adding nearly 500 in that time period. Rampant sport hunting of the animals had reduced the park's rhino population to just a dozen individuals in 1908. Over the last decade, however, Assam rangers have stepped-up patrols to guard against poaching and other threats, allowing the remaining rhinos to thrive. A total of 198 poachers have been arrested, and another 27 killed by forest guards as state officials have prioritized wildlife protections. "Rhino poaching is an international phenomenon and we are working wholeheartedly to stop it. It is because of this that we have sought help from experts from Nepal and even South Africa to help us meet the challenges," the Hussain said. Indian rhinos are now classified as a ‘vulnerable' species, and they are still very much under threat. Just as their counterparts in Africa, the rhinos in India and a small population in Nepal are still frequently targeted for their horns, which can fetch around $50,000 on the black market.